Self-care doesn't have to be complicated, overwhelming or time-consuming, and can, instead, be all about the small ways that you tune in and take care of you. Everyday provides amazing opportunities to practice self-care, and be grounded and refreshed. Read on for tips to simplify your self-care routine for everyday! 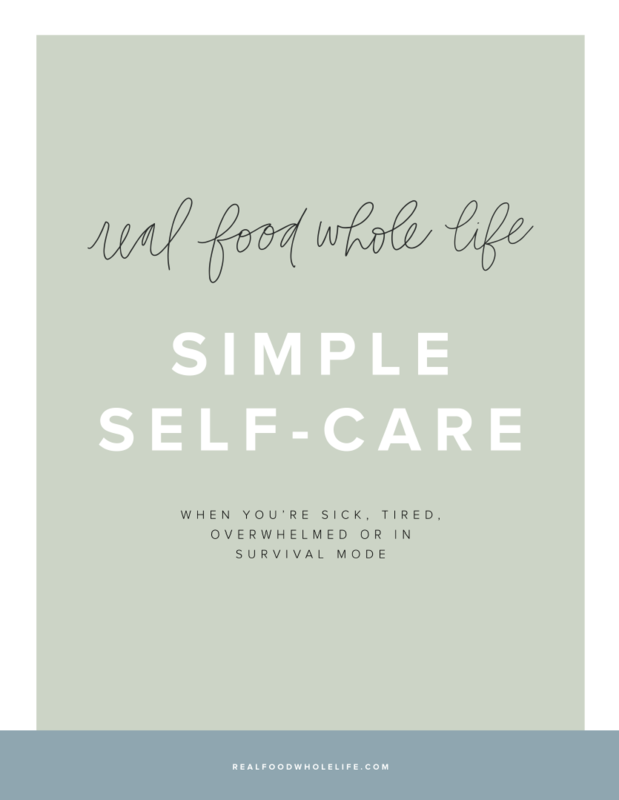 Grab the guide & get out of survival mode + into simple self-care. You know those chores and to-dos that you know will make your life so much easier? Stuff like prepping breakfast for the week, making the doctor appointment (for yourself), or scheduling a coffee date with a friend? Set aside an hour each week and then power through the list. Whatever gets done in your Power Hour gets done, whatever doesn’t gets moved to the next week. Taking care of new baby, an aging parent, or trying to balance work and school? Know that self-care will look different depending on the season of life that you're in. If life is hard at the moment, know that you're not doing it wrong. Embrace the season for what it is, and do your best to find little pockets of self-care when you can. Start thinking of self-care as all the small ways you tune in, listen to your body, and take small steps to take care of yourself. That morning glass of water, that mid-day walk, skipping the caffeine in the afternoon and turning off your phone in the evening? All self-care. Ditch the idea that it has to be grand and indulgent and over-the-top, and lean into the idea that you are already practicing self-care in your daily life. Giving yourself a little grace, a little self-compassion, and a little gentle is what self-care is all about. Life is full of tradeoffs. You can’t do everything all at once, because you are human. If sitting down to drink your cup of coffee means the kids toys don’t get picked up, be gentle. 5 | Take a (Nap or Pick-Up)... Sit, Breathe, Move. Mamas who spend the day taking care of little ones often struggle with most with finding time to take a break. Trust me, I get it. The struggle is real. Given your crazy schedule, get creative in carving out 15 minutes in the day for yourself. If you have children who still nap, take 15 minutes to actually just sit down and recharge. Check out Feel Good Morning Self-Care, above, for ideas. Know, too, that taking a break means something else won’t get done. That’s okay. Self-care is just as important as anything else on your list.